On 12 May, 2015, Micromax's venture Yu Televentures launched it's second metal clad Cyanogen-based smartphone branded as YU Yuphoria. It is priced at Rs. 6999, competing with budget 4G smartphones - Lenovo A6000 Plus, Redmi 2 and Moto E 2. 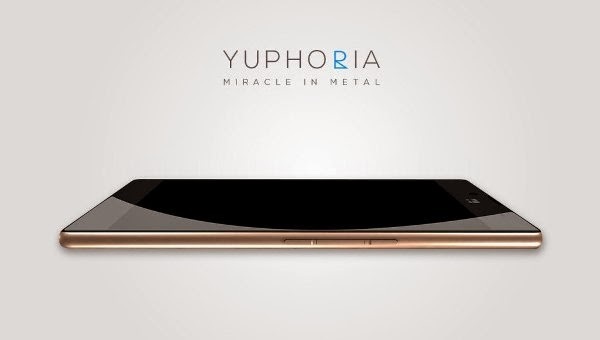 The Yuphoria will be sold exclusively through Amazon.in, just like its predecessor Yureka. Register now on Amazon.in for the sale on 28 May, 2PM. Yuphoria is equipped with 5" HD IPS screen with Corning Gorilla Glass 3 protection. It gets a 8 MP rear and 5 MP front camera. Micromax's Yuphoria is setting a benchmark for low end smartphones with its all metal frame body, whereas others at this price range are having plastic for exterior casing. Also, Yu Yuphoria and Lenovo A6000 Plus beat the other budget 4G smartphones by packing a 2GB RAM in comparison with their 1GB RAM memory. At Rs. 7000 price range Yuphoria and Lenovo A6000 Plus are having 16 GB internal memory but Yuphoria missing microSD card slot. Whereas Xiaomi Redmi 2 and Moto E 2 all are having 8 GB ROM with Micro SD card slot. All three are having 64-bit A53 1.2GHz quad-core Snapdragon 410 SoC CPU and Adreno 306 GPU. Yu Yuphoria and Moto E 2 comes with Android 5.0 L operating system. Yu Yuphoria runs on Android 5.0 Lollipop based Cyanogen OS 12 and the Moto E2 runs on Android 5.0.2 Lollipop out of the box. On the other hand Xiaomi Redmi 2 and Lenovo A6000 Plus runs on Android 4.4 Kitkat. Lenovo has recently announced to roll out the Lollipop OTA soon but Xiaomi in India is known for sticking to older version and not to provide any OTA for Android OS. Redmi 1s is still running on Android 4.3 Jelly Bean and Redmi 2 on Android 4.4 Kitkat with no announcement of any future update. Yuphoria, Redmi 2, A6000 Plus and Moto E2 are powered by Li-Ion 2,230, 2,200, 2,300 and a 2,390 mAh battery respectively.